KOKOMO, Ind. – As everyone in central Indiana knows, it snowed over the last two weeks – a lot! By some counts, Kokomo and Howard County were blanketed by more than 23 inches of the white stuff in a mere 14 day span. The kids seemed to love having an extra week tacked on to their Christmas Break, but for athletic administrators and student-athletes, it was a near nightmare. Hundreds of athletic events were postponed or cancelled around Indiana as the state dug out of its worst snow storm in decades. At least 21 varsity sporting events were affected in Howard County, sending local athletic directors scrambling via cell phone, email and text messages to communicate with other schools. At Kokomo High School alone, 11 athletic contests were affected from freshman through varsity – including the North Central Conference diving preliminaries that were scheduled for the Wildkat pool. But unlike most area athletic directors, Kokomo’s Jason Snyder wears a dual hat as he is also the girls basketball coach. Snyder said that while some schools have a “no school, no play” rule, Kokomo Schools do not – although the Kats still cancelled all events on the Monday and Tuesday after the snow storm. While still thinking of safety, by Wednesday teams were allowing for optional practices. Snyder said one of the biggest issues was making contact with other schools that had contests scheduled against the Wildkats in the days after the snow. He said his athletic staff came in to help, but with other schools also being out, it was tough to track down needed personnel. As for his Lady Wildkats, he said he was fortunate not to have a long layoff. 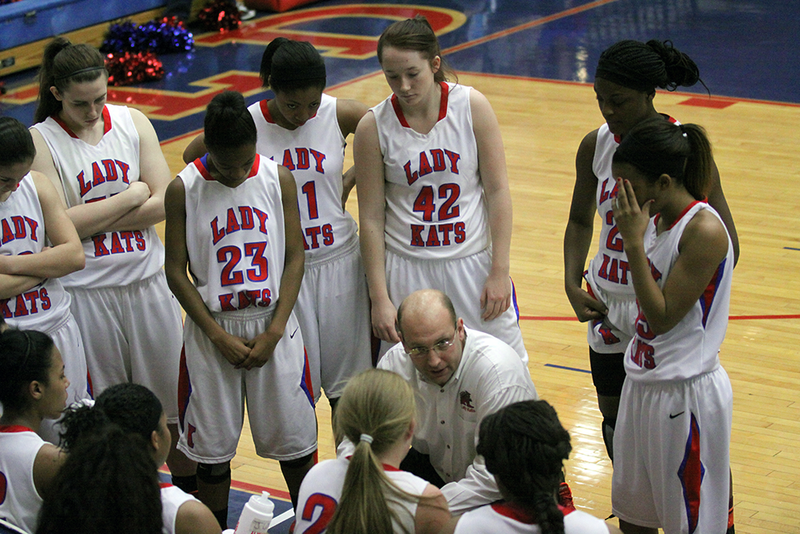 While the boys team had nearly two weeks off between games due to cancellations, the Lady Kats played on Jan. 3, 11 and 14. And after a three-game losing streak to Class 3A No. 9 Western, Carmel and Marion, his squad seems to have turned a corner and stands 8-5. But just as Snyder and the area took a deep breath from the snow, another four-plus inches fell on Jan. 18, causing a delay of the Howard County Boys Basketball Tournament finals. 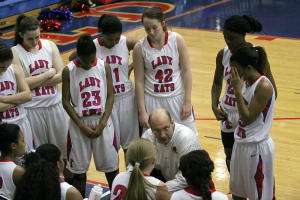 It also directly affected the Lady Kats – and they were not even playing a game. Saturday afternoon, Kokomo was en route to Illinois for a Monday morning game against Chicago Marist (54-49 victory) when they were diverted due to a serious accident on I-65 that shut down the interstate for more than 12 hours. Driving in a heavy snow, the Lady Kats took a detour and arrived in Chicago seven hours after leaving the City of Firsts. Ask any coach and they will tell you that they want their teams prepared to be playing their best during the tournament. For the Kokomo Lady Wildkats and its AD/head coach, that is exactly where they are – despite joining the rest of central Indiana and taking a few snow days – and a long detour – away from the court. This entry was posted in Kokomo, Lady Kats. Bookmark the permalink.